Dr Helen May-Simera studied biochemistry at the University of Bath. After completing her Master’s degree in 2003 she was a doctoral student at University College London, where she obtained her doctorate in Molecular genetics in 2008. She then moved to the USA to conduct research as a postdoc at the National Institutes of Health in Bethesda, initially at the National Institute on Deafness and Communication Disorders, and then later at the National Eye Institute. 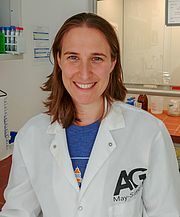 In 2014 she was awarded the Sofja Kovalevskaja award by the Alexander from Humboldt association, allowing her to continue her research at the University of Mainz, Germany as a young group leader. Her work has always revolved around understanding the molecular mechanisms underlying ciliary dysfunction in human disease. Primary cilia are long microtubule-based appendages that extend from the surface of most mammalian cells (Figure 1). Not to be confused with motile cilia, of which there are always multiple per cell and whose purpose it is to move fluid across membrane surfaces, primary cilia adopt sensory roles and are consequently also referred to as sensory cilia. 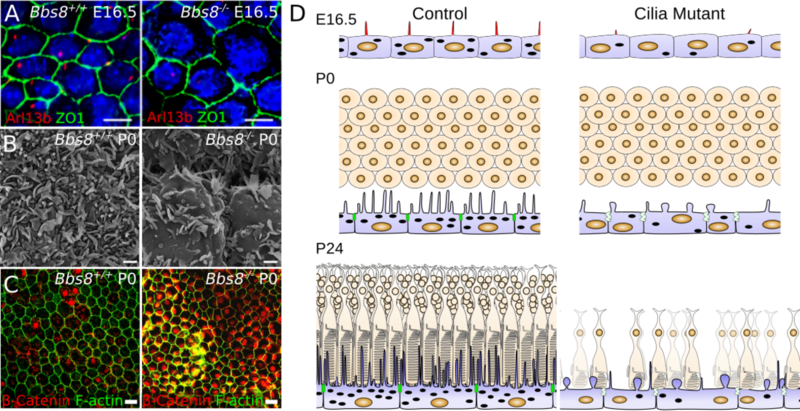 Ideally positioned as a signaling organelle, the primary cilium has been shown to regulate numerous signaling pathways, many of which are important not only in tissue homeostasis and disease, but also during development (Veland et al. 2009). Once long forgotten, this organelle has recently been 'rediscovered' as a result of its association with a multitude of human genetic diseases, collectively termed ciliopathies. Ocular pathogenesis is common in virtually all classes of syndromic ciliopathies, and disruptions in cilia genes have also been found to be causative in a growing number of non-syndromic retinal dystrophies (May-Simera et al. 2017). Undoubtedly, ciliary dysfunction in the ciliated photoreceptor of the retina leads to visual dysfunction, but the vertebrate eye also has many other ciliated cell types. These include the retinal pigment epithelium (RPE), a ciliated monolayer epithelium tightly associated with photoreceptors, which is critical for retinal function and survival (Strauss 2005) (Figure 2). Development and function of the RPE have been shown to depend on wingless (WNT) signaling, a core signaling pathway known to regulate diverse developmental processes (Burke 2008; May-Simera et al. 2012). 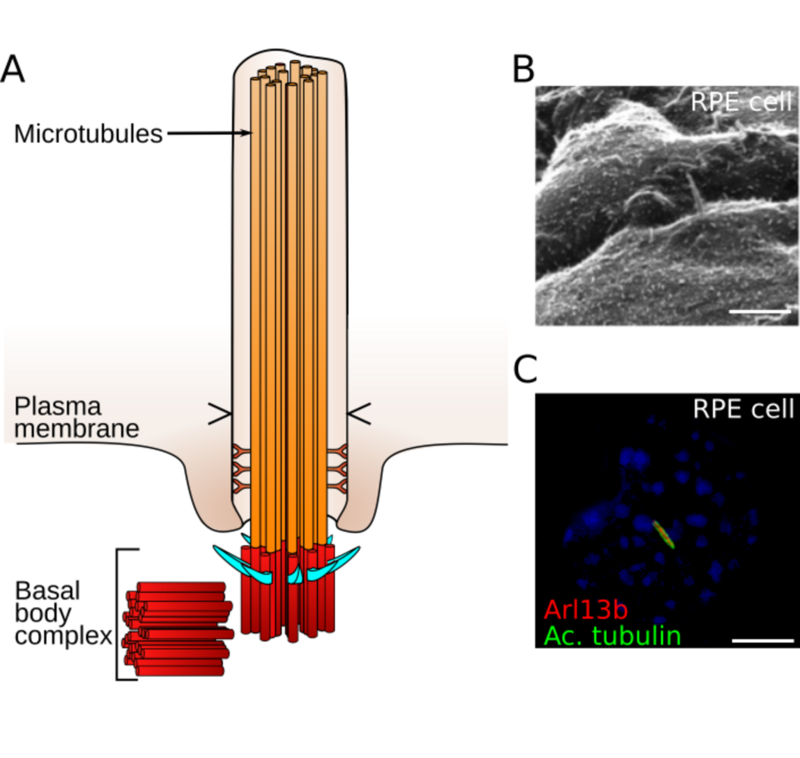 Based on the role of the primary cilium in regulating WNT signaling, we are testing the hypothesis that the primary cilium is involved in RPE development and maturation. All of the projects currently running in the lab address one or more of our main aims namely to decipher the association between ciliary function and WNT signaling; to define the role of primary cilia in the RPE and its effect on retinal function; and lastly to develop interventions to reduce ocular cilia defects. Figure 2: Primary cilia in the retinal pigment epithelium. A) Cross-section through the vertebrate eye with a close-up view of the RPE. 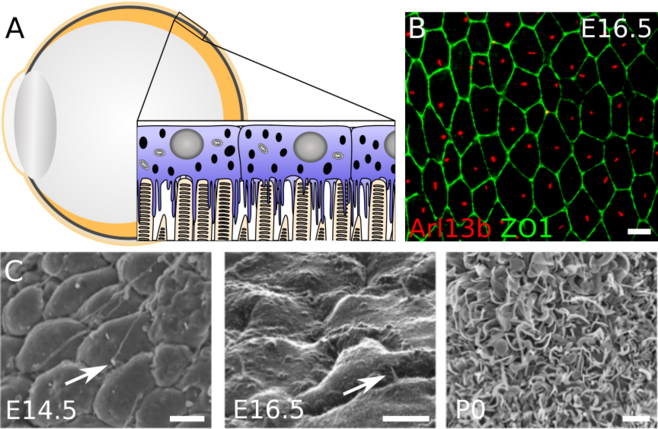 The apical processes of the RPE surround and engulf the distal end of the photoreceptor outer segments. B) Immunofluorescence microscopy image of an RPE flatmount preparation from an E16.5 mouse. A single cilium extends from the centre of each cell. Primary cilia are labeled with an antibody against Arl13b (red) and cell boundaries with ZO1 (green). C) Scanning electron micrographs of developing mouse RPE. Microtubule based primary cilia can be observed at E14.5. A single primary cilium extends from the centre of each cell at E16.5 and precedes development of actin-based apical processes by P0. Scale bars: 5 µm. Using a collection of in vivo and in vitro molecular biology techniques, we have recently shown that the primary cilium is important for correct maturation of the RPE, and that as the RPE matures, the cilium retracts(May-Simera et al. 2018). This consequently affects ciliary regulation of Wnt signaling, which is dysregulated in cilia mutant RPE (Figure 3). We suggest that these defects precede development or degeneration of photoreceptors of ciliopathy patients and thereby contribute to the visual phenotype. We are currently generating an RPE specific conditional mouse mutant in which cilia have only been ablated in the RPE. These mice will be carefully characterized in our visual assessment unit, looking at the electrical activity of the retina via electroretinograms (ERGs), the optomotor reflex in response to a global movement of the environment using a qOMR machine and via ocular coherence tomography (OCT) that enables visualization of the retinal morphology in vivo. Ultimately, our research will lead to increased understanding of the causes underlying progressive retinal degeneration with potential sight loss and will promote the development of better treatment strategies to improve the prognosis of affected individuals. Our work also expands the understanding of ciliary regulation of WNT signaling, which impacts many aspects of cell and molecular biology in development and disease. Figure 3: The primary cilium is required for RPE maturation. A) Immunofluorescence microscopy image of RPE flatmount preparations from control (Bbs8+/+) and cilia mutant (Bbs8-/-) RPE at E16.5. Fewer cells harbor cilia and remaining cilia are shorter upon loss of Bbs8. Primary cilia are labeled with an antibody against Arl13b (red) and cell boundaries with ZO1 (green). B) Scanning electron micrographs P0 RPE from control and mutant mice. Loss of cilia perturbs development of the apical processes. C) Nuclear β-CATENIN staining (red) is dramatically increased in Bbs8-/- RPE as compared to WT littermates (P0), F-Actin (green). D) Schematic representation of how dysfunctional primary cilia lead to defective RPE maturation that precedes photoreceptor defects seen in cilia mutant mice.